Each year, the Health Fund’s Board of Directors selects one outstanding project from among all current funded projects to receive the Janet Sevier Gilbreath Special Project Recognition Award, named in honor of our first Board Chairperson. 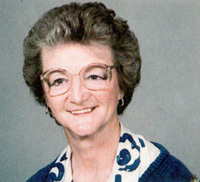 As Chairperson of the Wesley Taskforce appointed by the Kansas West Conference to develop a strategy for use of the $32 million coming to the conference, as defender of the Taskforce’s vision of an independent grantmaking agency growing out of the church’s role in healing, and as the Fund’s first Chairperson in implementing the vision, Janet’s ministry has sustained and motived others associated with this project. Through her vision, determination, and Christian values, Janet has given the Health Fund a character which will ensure that the Fund will forever be the church at work in a caring, professional manner to see that healing, health, and wholeness are received and appropriated by persons in this Conference and beyond. This award will be given each year to a project supported by the Health Fund which has, in the determination of the Board, done the most to advance the Fund’s and Janet’s vision of the Christian healing community. Scale – the project reached a reasonable number of participants based upon the need it is designed to address (local, regional, or state). Achievement of goals and objectives – the project had measurable goals and objectives and made substantial progress in meeting the planned targets. Leveraging – the project demonstrated value beyond that achieved solely with the resources provided by the Health Fund. Operational excellence – the project was conducted with best practices of management and has a governance structure which adds value to the work. Benefits to the “least of these” – the project targeted its work at the improvement of lives for populations which are underserved and often overlooked by free markets. Social justice and diversity – the project was motivated by a sense of social justice which empowers and enables. The project reflects a reasonable diversity in its board, staff, and participants. 1991 – Osborne County Hospice, Inc.